As an elderly veteran of three wars who is a little hard of hearing we understand why Bob Johnson assumed it was an earthquake to blame for pictures falling off the tables in his house. It was only when someone came to check on the man that Johnson realized one of his neighbors had actually driven a car into his house. Equally understandable was Johnson's expletive laced reaction to the fact 30 year old Joel Rhodes had put a Ford Mustang where his kitchen once was. 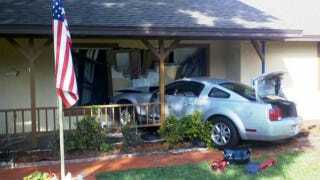 Rhodes lives two houses down from Johnson in West Melbourne, FL but still managed to "miss a turn" and drive directly into the elderly man's house. According to Johnson, this is the second time Joel Rhodes has missed the turn and damaged his property. The last time it happened Rhodes did $1200 worth of damage to the concrete culvert in front of the older man's house. According to Jeff Rhodes, Joel's father, his son blacked out which resulted in the Mustang ending up in Johnson's kitchen. Although Jeff Rhodes admits his son had an "air problem" with huffing in the past he has "no idea if that's related to this at all". West Melbourne police are still investigating the incident.